Saché and Yané are two of Queen Amidala’s main handmaidens in The Phantom Menace. They are the hardest to find in the film because they do not accompany Queen Amidala to Coruscant mid-way through the film with Sabé, Rabé, and Eirtaé. Because Saché and Yané stay in Naboo, there are fewer scenes to find them in, and in most of these scenes their faces are partially obscured. I believe that the women in the screenshot below (left to right) are Sabé, Rabé, Saché, Padmé, and Yané. Sofia Coppola played Saché and Candice Orwell played Yané in The Phantom Menace. Coppola is now known more for her directing (Lost in Translation, The Beguiled) than her acting. The Phantom Menace is the only credit, acting or otherwise, for Orwell on IMDB. It’s very difficult to spot Yané in the film, but you can get a fairly good look at her from this Battle of Naboo card from the Young Jedi Collectible Card Game. 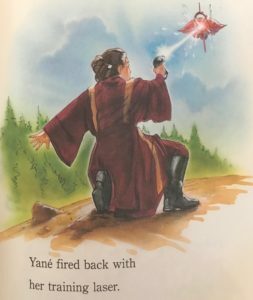 Yané also gets some love in the Young Readers book Queen in Disguise. Saché can be spotted in the screenshot below seated on the right. Saché was also a character in Star Wars Galaxies, a MMORPG game. Wookieepedia has more information about both Saché and Yané. 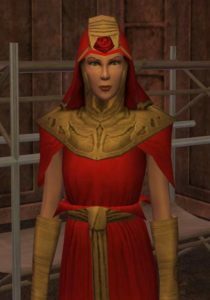 The photo of Saché from Star Wars Galaxies is from her Wookieepedia page (the only one I could find) and both pages for Saché and Yané include a list of all of the books and comics where they make appearances. Tomorrow I’m taking a look at background handmaidens in The Phantom Menace – some of which were never given names.